Today I want to share with seven ways to build Rapport on Facebook. I don’t mean spamming your company links everywhere or spamming Facebook! I’m going to share with you seven types of posts that will help you build relationships and rapport instead of resistance. If you are looking for a great training product on Social Media, you need Jessica Higdon’s 10K Social Media Recruiting. If you want to become a Social Media Marketing guru, I highly recommend this course. Understanding how to build rapport and relationships on Facebook and other Social Media platforms is essential if you want to succeed. So here are the 7 Ways to change your Facebook feed for the better! Understand that you don’t want just to do one of these, but you want to spread your post out amongst these categories. For instance, quotes are great, but you need more. These can be found all over the web and share with your comments. I would not recommend trying to brand them with your information just share them! People love How-Tos on all different subjects. When you find an excellent how-to post or have something that you know how to share it. Take your friends on your adventures with you. People love to feel like they are experiencing your experiences right there with you and your family or team. Who doesn’t love a good laugh now and then? Too many people keep their post so solemn that you want to avoid them at all cost. Make people laugh they will come back for more. Who doesn’t like to play trivia? I know I love it when someone posts a trivia question, and I can play along. Everyone likes to see success. Whether it’s yours or your team’s success breeds more success. 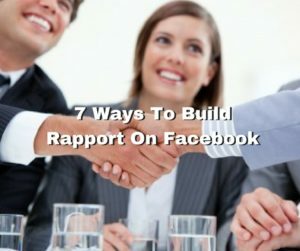 I hope these make sense to you, and I promise if you change what you are doing on your Facebook wall and start using these types of post you will build rapport. Understanding the Marketing on Facebook is all about building rapport and building relationships will change your success. Anyone can get online and start spamming their company and product links everywhere. It takes a good marketer to understand how to market properly.